Some people say that yozakura, or cherry blossom viewing at night, is more beautiful than enjoying them in sunlight. Sakura seem to take on a mystical appearance in the dark, and their color isn't drowned out. Here are 10 fantastic spots in Japan where you can see another gorgeous side of these fleeting, delicate flowers. Better known as an area of gourmet restaurants and a trendy part of town, Nakameguro has a lot more to offer beneath its surface. Walking along the Meguro River from the Ohashi to Taikobashi Bridges, with more than 800 cherry trees growing along the 3.8-kilometer-long (2.4-mile) path, cherry blossoms will never be out of sight. 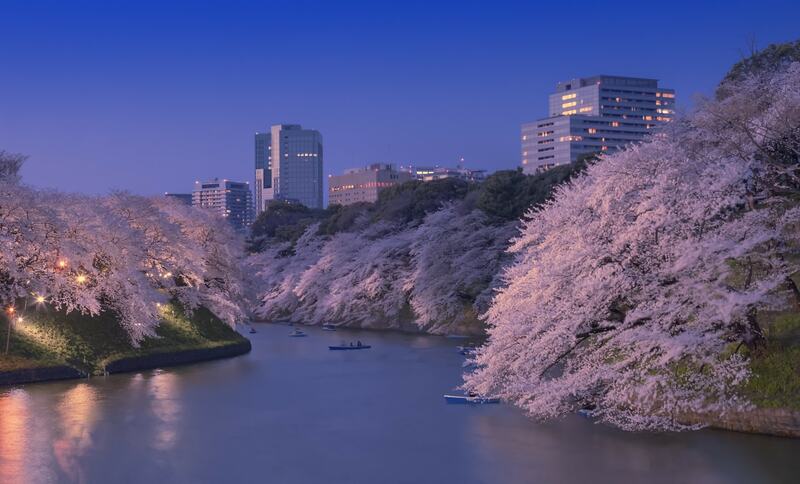 Along the 700-meter-long pedestrian path that lies along Chidorigafuchi, a moat on the west side of Tokyo's Imperial Palace, you'll see approximately 260 cherry trees blooming overhead. This is one of the most famous sakura viewing spots in the country, as visitors are able to experience an unforgettable walk under a beautiful floral tunnel. More than 1 million visitors come here every year. Kodaiji, a temple that was established by Toyotomi Hideyoshi’s wife, Nene, after Hideyoshi’s death, is well-known for its weeping cherry trees, known as Shidare-zakura. Approximately 50 cherry trees (of the Shidare-zakura, Yama-zakura and Somei Yoshino varieties) can be seen here. The Hirosaki Cherry Blossom Festival, which is held from April 23 to May 5 annually, traces its roots back to a yozakura viewing event in 1916. Said by some to be the most beautiful cherry blossoms in Japan, the cherry trees in Hirosaki exhibit a unique characteristic of having multiple sakura bloom from one floral bud. Visitors can see over 2,500 cherry trees at the site, along with the castle, which is the centerpiece of the surrounding park. Built in 1673 and spanning the Nishiki River in a series of five arches, springtime decorates the view of Kintaikyo Bridge in Yamaguchi Prefecture with cherry trees. Approximately 3,000 cherry trees, including ones in the adjacent Kikko Park, make the place an incredibly popular tourist destination, and earned it the distinction as a National Treasure in 1922. The sakura blossoms make this already picturesque sight transform into a mystically beautiful spot. Takato Joshi Koen, or Takato Castle Ruins Park, is the historic site of Takato Castle (demolished during the Meiji Period of 1868 to 1912) which is known as one of Japan’s Top 100 Castles. The park is also reputed by some to be one of the top three places in Japan to see cherry blossoms, following Hirosaki Castle above and Mount Yoshino in Nara Prefecture (the latter is better suited for daylight viewing). The cherry trees in the park, Ko-higan-zakura, are indigenous to the Takato district (part of Ina City) and are certified as a Natural Treasure of Nagano Prefecture. The oldest trees are estimated to be over 130 years of age. Known as one of the biggest yozakura spots in Japan, Takada Park has approximately 4,000 cherry trees (most of them Somei Yoshino). Illuminated by over 3,000 paper lanterns, the reflection of the cherry trees in the moat of Takada Castle seems like a sight from a completely different world. The lanterns are placed during the “Takada Castle Cherry Blossom Viewing for One Million People” event, which is held annually from April 1 to 17. While dotted with species such as Somei Yoshino and Yama-zakura, the blooming focal point at Maruyama Park (Maruyama Koen) is the weeping cherry tree, a symbolic Shidare-zakura at the center of the park, which was planted from the seeds of a much older tree that used to sit on this same place. The tree is over 80 years old, and stands roughly 12 meters (40 ft) tall. It is breathtaking when illuminated against dark skies! Rikugien is a circuit-style garden that was designed and built by Yanagisawa Yoshiyasu, a personal chamberlain of the fifth Tokugawa shogun, Tokugawa Tsunayoshi. While it took him seven years to complete the garden, it was definitely worth the time and effort. Now the place is known for its weeping cherry trees that look like waterfalls of light pink flowers. Already an extremely popular tourist destination among Japanese and overseas visitors alike, Kiyomizu-dera Temple couldn't fail to earn the top spot on our list of beautiful yozakura spots. Approximately 1,500 cherry trees, including Somei Yoshino and Yama-zakura can be seen blooming along the hillside. The view from the main hall (hondo) is magnificent. These beautiful sakura trees will refresh your mind and give you a reason to come to Kyoto again and again!